Ichirin Kumoi (雲居 一輪, Kumoi Ichirin) is a former human turned nyuudou user that the heroine encounters on their arrival at the Palanquin Ship. Along with Unzan, she guards the Palanquin Ship of her own accord in order to assist in the revival of Byakuren Hijiri. 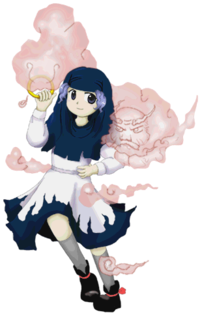 Ichirin, along with Unzan, first appeared as the Third stage boss of Undefined Fantastic Object and later as a playable character in Hopeless Masquerade and Urban Legend in Limbo. As part of a team with Unzan, they work together to face their challenges. Ichirin is described as having a pleasant personality, but can also be tenacious at times. Since Unzan is a nyuudou, she's got the ability to manipulate her partner Unzan, mainly to perform attacks. In spell cards, the danmaku are all shot by Unzan, with Ichirin controlling, although there was one spell card Lightning "Electrified Nyuudou" where she did shoot danmaku herself. On the other hand, the non-spell cards are entirely shot by Ichirin who, strangely among the Touhou Project characters, doesn't use danmaku in the shape of bullets at all, shooting only lasers and long-shaped danmaku. As a member of the Myouren Temple, Ichirin lives there and trains as a priest. Because of Unzan's physical strength, the two of them are tasked with doing physical labor, especially in high places. Ichirin used to be human. Having heard of a man-eating foreseeing nyuudou, she dauntlessly went to encounter him and give him a scare. When she finally saw what looked like the feet of a monk, taking care not to raise her head, she shouted "The foreseeing nyuudou was foreseen! ", a repelling spell. While that would normally be enough to make a nyuudou disappear, the sheer shock of his utter defeat and resulting admiration for the courageous girl prompted Unzan to devote the rest of his life to protecting her. After this, Ichirin's life completely changed - she no longer felt any fear towards youkai, and was hated by humans at times. After going though a tempestuous life, before she knew it, she had become a youkai. 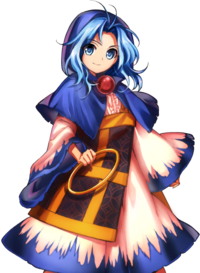 By the time of Undefined Fantastic Object, Ichirin and Unzan have both joined Byakuren Hijiri due to her acceptance of youkai as well as her understanding of the human heart. 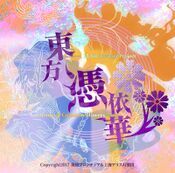 Ichirin's inspiration may come from the second volume of Shigi san Engi. In the story, Daigo Tennou becomes dangerously ill one day, so his subjects visited Myouren after hearing of his miracles to beg him to come and pray for the emperor's health. Myouren rejected their request, but proposed that he would pray at his temple and he would inform them when he finished. After approximately three days passed, Ken no Gohou (剣の護法), a flying messenger of Bishamonten, appeared near the court, who implied the end of Myouren's praying. After that, the emperor recovered very soon. This messenger had a sword in one hand, numerous blades around his neck, and he flew on the wheel very similar to a dharmacakra, followed by wind or clouds. Another possible source of inspiration for the Ichirin and Unzan character is an old Japanese tale about tsukumogami (youkai born from an old object attaining a spirit of its own after being around for 100 years). This story features a tsukumogami born from a Buddhist rosary called Ichiren Nyuudou. Ichirin and Unzan as illustrated in Symposium of Post-mysticism. Ichirin Kumoi (雲居 一輪) is her full name. The characters for Kumoi (雲居) mean "Residence in the Clouds". The characters for Ichirin (一輪) mean "One Wheel". This name would indicate two directions. First, it is possible that Ichirin's name is partly inspired from the aforementioned Dharmacakra: It is called "Hourin" (法輪) in Japanese, a noun which shares one kanji with Ichirin's name. Second, "ichi-rin" is a unit of counting flowers, e.g. 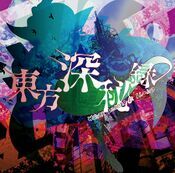 "ichi-rin no bara" (single rose); her and Unzan's title also includes the word relating to flower "tairin" (大輪), which means "the bigness of flower" or "big flower". Ichirin has light purple wavy hair, and dark purple eyes. She carries a medium-sized yellow ring in her right hand. On her head, she wears a headdress similar to a Hijab or a nun's headdress. She wears a white dress with a blue trim at the bottom, and wears black shoes. Her outfit closely resembles that of a Buddhist nun's, which was a component ZUN thought appropriate for the Buddhist-themed story. She is also always seen with Unzan. In Hopeless Masquerade, her hair is shown to be shoulder-length in a shade of cyan. Her black shoes are white, her top is a button-up blouse, and she has a red orb around her neck. She also carries two rings, one in each hand. Over her blouse and skirt, she also has a black and gold Japanese-style kesa, which she wears over her shoulder. 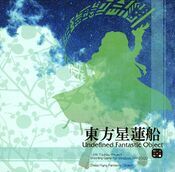 In Undefined Fantastic Object, she stands guard at the Palanquin Ship in order to keep those who would prevent Byakuren Hijiri's revival away. Initially she attacks the heroine under the assumption that they were there to stop her, but upon realizing they had some parts of the treasure needed to unseal Byakuren, she assumed they were on her side and happily let them through. As the Guarded, she is Unzan's handler, and he is her protector. He is devoted to watching over her. As he is very shy, he will speak very quietly and only to her. Not much is known about Ichirin's relationships with other characters, save for Byakuren Hijiri. 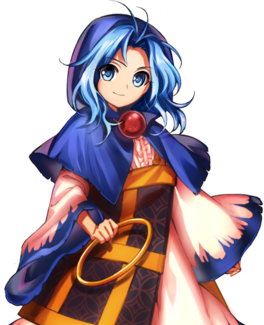 She is a devout follower of Byakuren, who showed kindness not only towards her but towards Unzan as well. She is also part of Minamitsu Murasa's group of youkai. During Stage 3, Ichirin refers to Byakuren using the words as 姐御 (anego) and 姐さん (ane-san or nee-san). 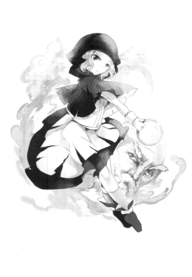 Both terms are variants on "elder sister", but these versions usually mean a female superior who is not one's real sister, such as a female gang boss. Essentially, Unzan is the Stage 3 boss of Undefined Fantastic Object, not Ichirin; Ichirin herself came as a way to have an actual character on the screen for an hit box according to ZUN. 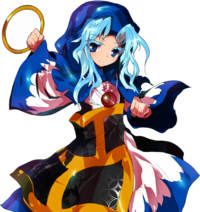 When trying to think of what type of youkai to call Ichirin in Part 3 of Symposium of Post-mysticism, even Byakuren, who calls herself an expert on youkai, could only hesitantly refer to her as "um... a controller of a giant nyuudou." 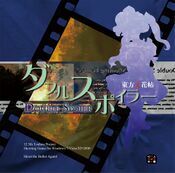 One of her alternate color palettes in Hopeless Masquerade resembles Index from To Aru Majutsu no Index. A youkai guarding the ship which seems to have a secret. She was using nyuudou to keep watch. She wasn't ordered by someone to stand guard, she's doing it of her own accord. It's unknown just what she's after. Ichirin's personality is very straightforward, but she's quick-thinking and understands things easily. Unzan is kind of dull, so it's easy for her to control him. Since Ichirin is a member of Murasa's group of youkai, she also misses Byakuren. She is devoted to Byakuren, who was even kind to her nyuudou companion. The Myouren Temple's chief priest has left the temple for a while. but she told Ichirin, a priest in-training, to keep watch over the temple. However, the situation changes quickly. Challengers appeared at the Myouren Temple. and when it reaches the end, she enters an enraged mode that increases her attack power. This rage mode boasts attack power high enough to be able to turn the tides of battle in an instant. Answering the voices of popularity from the audience, Unzan enters the battle for real. and can perform attacks of an overwhelming scale. but as she is being protected by Unzan, any damage she takes will be decreased, and can easily return the favor to a careless opponent that counterattacks. An overwhelming power character, accompanied by Unzan who can mow down anything; That’s Ichirin. No matter what disadvantages or unfavorable situations may bring, those fists blow them away with one punch. This time around she’s acquired the ability to use her Occult Attack to release Hasshaku-sama’s power onto her opponent, trapping them in a cursed, enclosed space. "Lady Hijiri came up with this plan. That is, to investigate the Perfect Possessions in a team of two." A youkai monk from the temple, who can control nyuudou. She ventures into the possession battles at the behest of her master, who is investigating the Perfect Possession incident, but she and her partner seem to have quarreled to no end over which of them has the authority of being the pair's master. She fights with the overwhelming power and reach of her nyuudou partner, Unzan. As long as you can compensate for her slow speed, your opponents will be helpless. ↑ Foreseeing nyuudou are youkai monks who only show their feet at first. When their victim would look up to see their face, they would grow larger so that their heads would remain out of sight. It's been said that when the victim looks straight up, their head would get chopped off. ↑ Chara☆Mel. "Interview with Chara☆Mel" (in 日本語). Retrieved August 27, 2011. This page was last edited on 18 April 2019, at 05:00.